Hey Winnipeg: was November warm or cold? Hey Winnipeg: was this a cold November, or a warm November? Winnipeggers need no reminding that November 2017 started off cold. Very cold. Record-breaking, in fact: November 9th set a frigid new record low of -23.7 °C. Predictably, many online commentators used the cold as a talking point to deny the reality of climate change. This happens every winter: the arrival of cold weather or snow is greeted with a chorus of climate change denial. One reason this happens is that people are used to dealing with and talking about weather, which changes quite a lot from day to day and hour to hour. We also tend to remember extremes and recent conditions more than long-term trends. When we talk about climate change, on the other hand, the “change” that really matters takes place over much longer time scales. Cold days, months, and even whole seasons can take place in a year or decade that’s nonetheless warmer than average, and it’s those longer-term warming trends that we worry about. 2013 is a good example: the winter was cold, averaging 0.5 °C below the 20th century winter average. But the other seasons were much warmer, and 2013 wound up being 0.5 °C warmer than the 20th century average. What about this November in Winnipeg? What happened during the rest of the month? Once the first week-and-a-half was over, Winnipeg was treated to weeks of sloppy and slushy fall-like weather, much like November 2016. This graph shows Winnipeg temperatures for November, and puts them in the context of average and record highs and lows. Maximum and minimum daily temperatures recorded in Winnipeg, Manitoba throughout November 2017, compared long-term averages and extremes. What’s really interesting is how November started out much colder than normal, and ended up much warmer than normal. We broke records for cold at the start of the month, and nearly broke records for heat at the end. In the end, November 2017 was pretty much average. 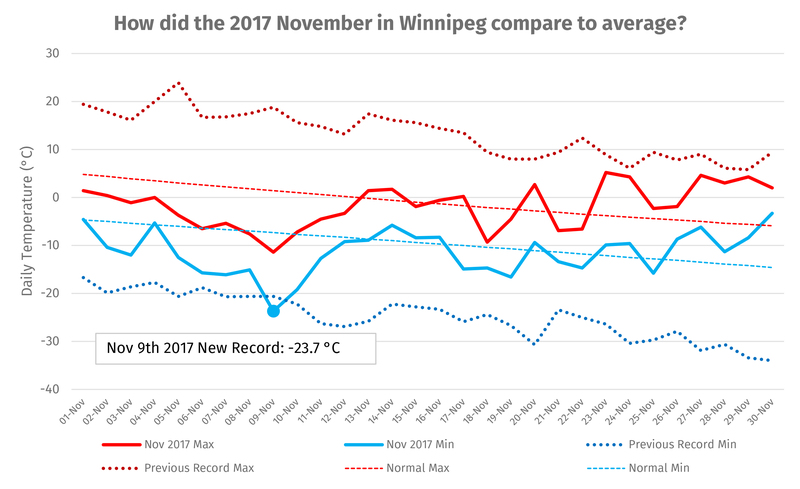 How did Winnipeg’s November temperatures compare to the rest of 2017? Here’s a graph that shows how much above (red) or below (blue) average each day in Winnipeg has been to date. Daily mean temperature anomalies (differences between observations and long-term averages) for Winnipeg, from January 1st 2017 to December 5th 2017. It’s pretty clear that the blue (colder) areas are much smaller than the red (warmer) areas. Adding up the differences, 2017 has so far been 1 °C warmer than average in Winnipeg, despite that record-breaking cold in November. What all this really shows is that to understand climate and climate change we have to pay attention to overall averages more than memorable extremes. We also need to remember that cold temperatures (even record breaking cold temperatures!) can still happen despite the fact that the overall climate is warming. Temperature data was accessed from Environment Canada’s website. For simplicity, we used Environment Canada’s online Almanac to determine what the long-term average daily temperature are for Winnipeg. The Almanac computes averages across the entire service record for a weather station.